Select your favorite K-Pop Songs of the Day/Week everyday during April 20 - 27. Results will be aired on Kpop Station every Sunday during the #Kpop Top 25 Listeners' Choice Weekly Countdown show airing this Sunday at 5AM KST / Saturday 4PM EST, April 27, 2018 on Big B Radio #KPop Station. *Green text songs are new debut/comeback songs. *Red text are songs that will leave the poll this week. 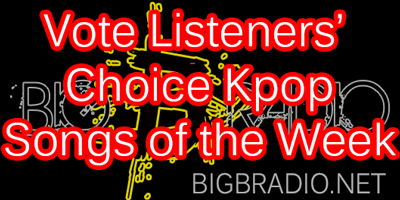 Every votes will count towards the next Big B Radio Listeners' Choice #Kpop Top 25 Weekly Countdown airing every Saturday 4PM EST and Sunday 5AM KST on Big B Radio #Kpop Station. Thank you for voting! You may vote for as many songs as you like for your favorite K-pop songs only once per day until 1:00AM KST April 26/ 12:00 PM EST April 27, 2018. Copyright © 2019 Big B Radio. Some rights reserved.